De Smet is a city in and the county seat of Kingsbury County, South Dakota, United States. Ingalls Homestead - Laura's Living Prairie has been added to your itinerary. Kick off your visit on the 28th (Tue): make a trip to Laura Ingalls Wilder Memorial, stroll the grounds of De Smet Cemetery, and then steep yourself in history at Ingalls Homestead - Laura's Living Prairie. Get ready for a full day of sightseeing on the 29th (Wed): admire the majestic nature at Oakwood Lakes State Park. For reviews, maps, where to stay, and more tourist information, read our De Smet route planner . Chicago to De Smet is an approximately 9.5-hour car ride. You can also fly. Plan for little chillier nights when traveling from Chicago in May since evenings lows in De Smet dip to 45°F. Wrap up your sightseeing by early afternoon on the 30th (Thu) to allow time for travel to Crazy Horse. Crazy Horse Memorial has been added to your itinerary. Start off your visit on the 30th (Thu): get a new perspective on nature at Native American Educational and Cultural Center and then pause for some photo ops at Crazy Horse Memorial. On the next day, take your sightseeing to a higher altitude at Harney Peak. For other places to visit, maps, reviews, and other tourist information, read our Crazy Horse journey planner . The Route module can help you plan travel from De Smet to Crazy Horse. Due to the time zone difference, you'll gain 1 hour traveling from De Smet to Crazy Horse. Expect a bit cooler temperatures when traveling from De Smet in May; daily highs in Crazy Horse reach 59°F and lows reach 37°F. Wrap up your sightseeing by early afternoon on the 1st (Sat) to allow time for the car ride to Hill City. Hill City is the oldest existing city in Pennington County, South Dakota, United States. You've now added Black Hills to your itinerary. Kick off your visit on the 1st (Sat): get curious at Sanford Lab Homestake Visitor Center and then explore the striking landscape of Black Hills. Keep things going the next day: learn more about the world around you at The Museum @ Black Hills Institute. For ratings, more things to do, traveler tips, and tourist information, read our Hill City driving holiday planner . Hill City is just a short distance from Crazy Horse. Expect a daytime high around 73°F in June, and nighttime lows around 48°F. On the 3rd (Mon), wrap the sightseeing up by early afternoon so you can drive to Keystone. You've now added Mount Rushmore National Memorial to your itinerary. Kick off your visit on the 3rd (Mon): look for all kinds of wild species at Windcross Conservancy. 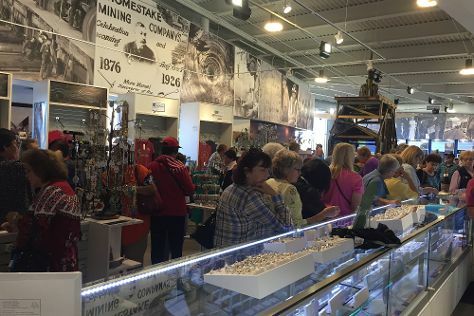 Keep things going the next day: pause for some photo ops at Mount Rushmore National Memorial, then stop by Goodtyme Photo, and then get advice or help at Peter Norbeck Visitors Center. For reviews, where to stay, photos, and tourist information, refer to the Keystone trip planner . Keystone is just a stone's throw from Hill City. June in Keystone sees daily highs of 73°F and lows of 48°F at night. Wrap up your sightseeing on the 4th (Tue) to allow time to travel back home.